Despite the rhetoric from Washington politicians, Americans know the economy remains weak. Things may be booming in Washington D.C. and the surrounding suburbs, and they may be doing great on Wall Street and Silicon Valley, but the economy is really tough for many areas throughout the country. The recovery of the last eight years has been among the weakest in history. The real unemployment rate, as measured by the Bureau of Labor Statistics U-6 index, is 9.6 percent. The workforce participation rate is only 62.8 percent, meaning over 94 million Americans have given up looking for work. In New York, we see the devastating effects of bad federal policies coupled with crushing state taxes, regulations and cronyism. Upstate New York lost 20 percent of manufacturing jobs from 2000 to 2004 and another 8 percent from 2004 to 2008. In the last three decades population has decreased by over 65,000, giving New York the largest outmigration rate in the nation. From 2010 to 2015, every county in the 22nd Congressional district lost more than 1,000 residents. 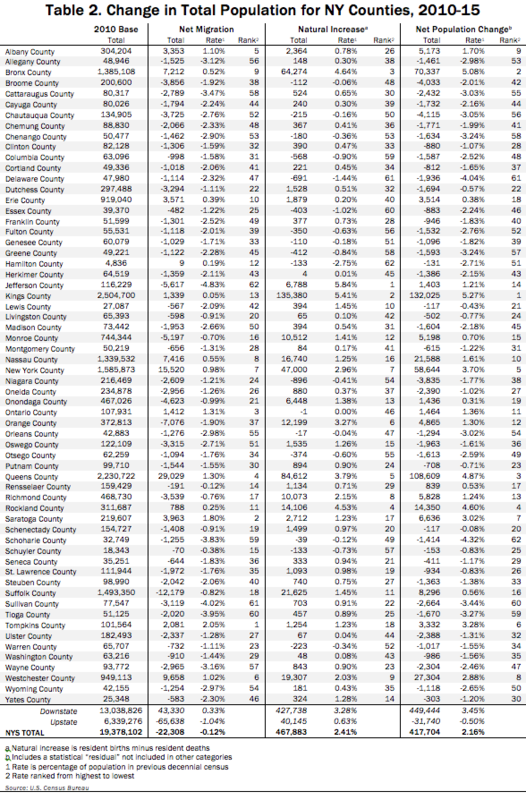 The highest population losses were in Broome County with 3,856 residents, Oswego County with 3,315 residents, and Oneida County with 2,956 residents. We can begin to turn the economy around, but it’s time to move past the failed policies of the past. If there is anything New York has learned, higher taxes, more regulation, more spending more cronyism, and more government will not solve the problem. As the co-owner of a small manufacturing business, I know that American workers, farmers and small businesses need a level playing field, and they need the government off their backs and out of their pockets. That is how we will begin to turn the economy around and start making New York competitive again. The uncertainty in our economy is one of the greatest barriers to job creation and economic development. Small businesses create nearly 70 percent of all new jobs. Small businesses don’t have the cash flow to invest in developing new products or hiring new employees if they face the constant threat of tax hikes, regulatory actions and increasing energy prices. The most important thing Congress can do is reassure Americans that they can invest without fear of crippling tax hikes and regulations, or spiking energy costs. American workers and their products can compete with anyone in the world when given a level playing field. Unfortunately, politicians are creating trade deals that don’t create a level playing field. To make matters worse, they refuse to hold our trading partners accountable when they cheat, manipulate currency, dump products on our markets and steal our intellectual property. I have seen firsthand the clients our business has lost as manufacturing has moved overseas. Congress needs to stand up for American workers by stopping deals like the Trans-Pacific Partnership, which ignores currency manipulation and border taxes, and reexamining all of our trade deals to see how they can be improved to benefit American workers. Federal regulations are crushing both farmers and manufacturers. They are a major culprit of why American manufacturers find it hard to compete with foreign competitors, and why jobs are lost to overseas companies. In 2012 alone, federal regulations cost American business over $2 trillion dollars. Over 80 percent of American manufacturers cite federal regulations as a top challenge they face. Americans need legislation to require congressional approval for any regulation with significant cost. Unelected, unaccountable bureaucrats should not have the power to put someone out of business. The tax code is too long, too complex and has too many giveaways to those with the resources to rig the system. We need to lower the tax burden for middle and low income Americans, and small businesses. The United States has one of the highest corporate tax rates in the industrialized world. As a result, companies keep their cash offshore and invest in other countries with lower tax rates. By reducing our corporate tax rate and eliminating special tax breaks, we can make the United States the place to invest and create a more level playing field for businesses of all sizes. Transportation infrastructure is vital to our economic future. Transportation is critical to New York’s agricultural and manufacturing economy. Whether it’s farmers getting their goods to market, or manufacturers getting raw materials in the door and getting finished products to market, transportation is critical. America’s roads and bridges are crumbling. Politicians have been raiding the Highway Trust Fund. The Highway Trust Fund where our gas tax dollars go, have been robbed to pay for bike paths, flowerbeds, transportation museums, bridges to nowhere and mass transit boondoggles. Despite the end of earmarks, the appropriations process still offers ample opportunity for Washington politicians to steer money away from priorities to pet projects and special interests. All federal transportation projects need to be ranked in the states on the basis of congestion relief and positive economic impact. I support innovative and cost-effective ways to improve the nation’s infrastructure. Public-private partnerships to construct new roads are one example. All too often, government spends money on corporate welfare schemes that don’t create jobs. Whether its President Obama’s failed stimulus, scams like Solyndra or Governor Cuomo’s failed StartUp New York program, the politicians are great at rewarding their donors and special interest friends but awful at creating jobs. Government shouldn’t be creating winners and losers, or letting big corporations lobby through laws and regulations that punish the competition. Too often big business and big government work together to put small and medium sized businesses out of work—even though smaller firms created 70 percent of the jobs. We need an “all of the above” energy plan that creates American jobs and ends our dependence on Middle East oil. America is rich with abundant energy resources. We could achieve energy independence by utilizing environmentally friendly domestic production of oil, coal and natural gas in the near term while we develop the clean alternative energy sources of the future, including, nuclear power, wind, solar, biomass, hydrogen, and hydropower, among others. We need to build a new energy economy that creates jobs by developing new energy technologies here in the United States. Energy technology should be the result of a free market environment that creates innovation, not higher taxes, more regulation and more government. We don’t need more Solyndra scams. We don’t need the government picking winners and losers. Abundant, affordable energy is key to economic growth. Expensive energy is one of the reasons US jobs are going overseas. We can’t compete with Mexico and China if politicians are going to place regulations on us that put us at a competitive disadvantage.